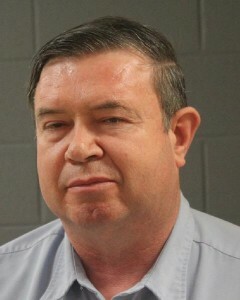 ST. GEORGE – The 11th and final member of a polygamous sect indicted of conspiring to commit fraud and money laundering was taken into custody Tuesday morning. Kimball Dee Barlow, 51, of Hildale, Utah, was booked into the Washington County Purgatory Correctional Facility at 9:30 a.m. and is scheduled to appear at a 1 p.m. initial hearing in federal court Wednesday. Barlow is one of 11 members of the Fundamentalist Church of Jesus Christ of Latter Day Saints who were indicted by the federal government over accusations of conspiring to commit Supplemental Nutrition Assistance Program benefits fraud and money laundering. Both are federal felony-level offenses. Prosecutors allege FLDS members receiving food stamp benefits were directed by church leaders to give their government-issued benefit cards to the church. Money from those accounts was spent at church-run stores and businesses and otherwise diverted, the indictment alleges. The operation is estimated to involve over $12 million in welfare fraud. Last week the twin-communities of Hildale, Utah, and Colorado City, Arizona, also known collectively as Short Creek, was the site of a mutli-agency operation by law enforcement that resulted in multiple arrests. Others named in the indictment include Lyle Steed Jeffs, 56, John Clifton Wayman, 56, Winford Johnson Barlow, 50, Rulon Mormon Barlow, 45, Ruth Peine Barlow, 41, and Preston Yates Barlow, 41, all of Hildale; Seth Steed Jeffs, 42, of Custer, South Dakota; and Nephi Steed Allred, age not specified, Hyrum Bygnal Dutson, 55, and Kristal Meldrum Dutson, 55, all of Colorado City, Arizona. The alleged conspirators could face up to 20 years in jail if convicted. St. George News Assistant Editor Kimberly Scott contributed to this story. First mistake,admitting ethnicity.They should have just said they were illegal aliens and the feds would have been heaping all kinds of freebies on them,with NO FEAR of prosecution.BUT….. whatever you say don’t say you are a veteran,….you get NOTHING.